Manhattan Beach’s private security force Beachside Patrol is set to dissolve on January 1st, after 39 years serving the Manhattan Beach community. It’s being closely followed by SheepsheadBites, who sums it up with “Money, Politics At Heart Of Beachside Patrol Problems“. Case Dismissed in Manhattan Beach Incident. Remember way back in June when civil rights died in Manhattan Beach? Yeah, I really don’t remember either but either way, there is an update to the story. Although the situation is long over here is a news piece that aired on cbs. I attended the 61 precinct community council meeting last night and I am glad to say that it wasnâ€™t boring. At the same time, the meeting wasnâ€™t an uproarious mess, it was actually quite smooth. We all remember Manhattan Beach right? They have had more of their fair share of crazy news but the flow of this crazy news doesn’t seem to ever stop. I know some of you hate me for even bringing up Manhattan Beach on this site, but I have to say, some really important stuff going outside our little world. Think of Horton hears a who. Friday, June 6th was senior cut day for some local schools, and then they head down to Manhattan Beach for a day of sun and fun, but the past two years have been anything but fun. 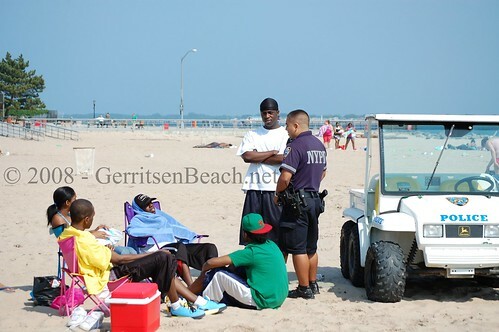 Last year there was the infamous email from Dr. Ron calling beachgoers “thugs”. This year in anticipation of the return of the “thugs”, the residents have been demanding all year for a plan addressing “Senior Cut Day” and all that comes with it. Well Senior Cut came and it did not go well for beachgoers their civil rights went out the window. Before I get to that really big news. Here is what I personally saw. Knowing senior cut day was Friday. I made sure to at least make an effort to get down there and catch the “thugs” in action. 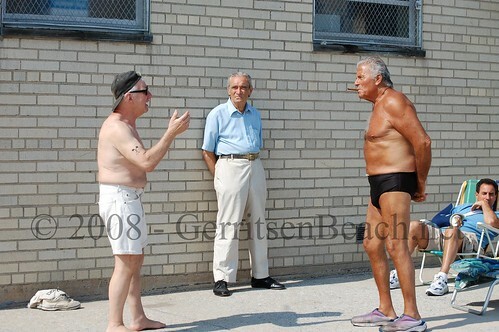 On my way down to Manhattan Beach I had heard that Gene Berardelli, Sheepshead Bay/Plumb Beach Civic’s attorney, was arrested for disorderly conduct. I was surprised, mainly because this is a guy who sits on the 61 PRECINCT COMMUNITY COUNCIL and I couldn’t see him getting arrested. With this in mind I headed to the beach. VERY LARGE MANHATTAN BEACH NEWS COMING! INVOLVES ARRESTS, SENIOR CUT DAY, POLICE-RACISM, UTTER INSANITY, THE CAPTAIN ON A BULL HORN, KIDS BEING FORCED OFF THE BEACH, DISALLOWING “KIDS”, TURNING “SOME” KIDS AWAY AT THE SHEEPSHEAD BRIDGE, WHILE ALLOWING OTHERS. STORY, PICTURES AND VIDEO TO COME. To better represent south Brooklyn, a larger group representing all of the groups involved is forming. It will be called the South Brooklyn Civic Alliance. It is being organized by Marine Park and Madison-Marine-Homecrest Civics. More information on this as it comes. Youzdjan Bekir aka “Eugene” aka “Ozcan” was leaving school at about 12:40 when he ran into an automobile attempting to make a left hand turn onto Irwin Street. Councilman Mike Nelson’s Former Deputy Chief of Staff Wants Apology, for Posting on Forums for Nelson, then Being Outed by Nelson. Every politician has his enemies; Councilman Mike Nelson apparently has a lot and keeps piling up more.